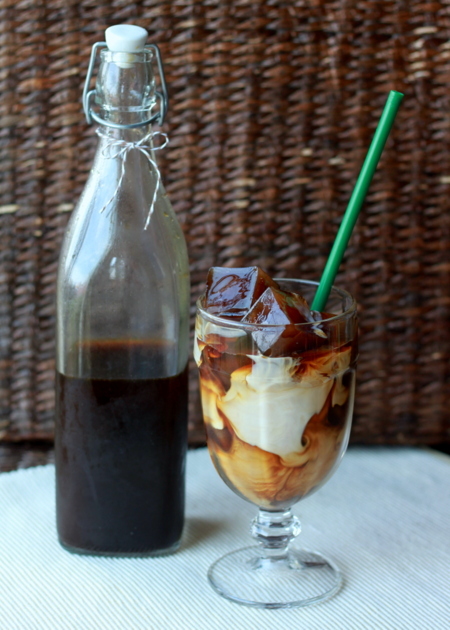 Update 4/2014: Be sure to check out my new, improved cold-brewed iced coffee tutorial with step-by-step instructions and lessons learned since first posting about cold-brewed iced coffee. I started making my iced coffee this way a couple of years ago, thanks to this New York Times recipe that convinced me to do so. You add coffee grounds to cold water and let it sit at room temperature for several hours. Then you strain it through a coffee filter, and the result is a deep, rich, dark, and caffeine-packed glass of iced coffee. It’s a concentrate, so you’ll want to dilute it with water unless you’re in need of a serious buzz. And trust me – this stuff can pack a serious wallop. I use a ratio of about 2/3 of the concentrate to 1/3 water, stir in a spoonful of sugar and some half-and-half, and finally I plop in some coffee ice cubes. Then I smile because life just got a little sweeter. And a lot more energized. Add your favorite ground coffee beans to cold water, let it sit, strain and then enjoy several glasses of deep, rich, dark, and caffeine-packed iced coffee. It’s easy and way cheaper than your Starbucks habit. Not that I know anything about Starbucks addiction. Ahem. Add the coffee grounds and the water to a large jar or pitcher. Stir. Cover and let rest at room temperature overnight or up to 12 hours. Strain through a coffee filter or a fine-mesh sieve lined with cheesecloth. I use a funnel and coffee filter and strain the coffee right into the glass bottle I store it in. To serve, mix one part coffee mixture (it’s quite concentrated) with one part water in a tall glass, leaving room for ice. Stir in sugar and milk/half-and-half if desired, to taste. Add ice or coffee ice cubes. Serve. Cold-brewed iced coffee concentrate keeps in the refrigerator for up to a week. I’m trying this out right as we speak. I just put the storage jars away for 12 hours <3 I hope it tastes as good as it looks! Hee! Well, at least you’re honest. The coffee, the first one on the list, looks delicious, I can’t wait to try it, some of your recipes are really easy looking, I’ll try those, the slow cooker recipes are good for me right now, looking forward to reading all of your recipes. Thanks. Thanks, Madeleine! So glad you visited my blog. It’s quite potent, isn’t it?! Im off to put my coffee into a jar now and i’ll be letting you know what I think …………… It looks pretty yummy!! Forgot the rating. Off to make another glass! You can make this by brewing your coffee regularly threw your coffee pot, add creamer and ice, there you go, Ice Coffee, I drink it all the time. I’d like to make the concentrate in a larger quantity. Do you know how long it might last in the refrigerator? Hi Beth, I keep it in the fridge for about five days and it’s still fine, though that might be pushing it. A good guideline would be 3 – 4 days, I think. Hmm, you could also freeze the concentrate, pulling out just what you want one serving at a time, to make it last even longer. Seriously potent coffee ice cubes! Beth Ferrerira, it will keep a very long time in the fridge – as in, a month or more. I use a 10-oz bag of Pilon or Cafe Bustelo espresso grind in one of those large square 13-cup Glad food storage containers. Fill it with water, stir gently but thoroughly with a whisk, put the lid on and leave it on the counter for 2 days. I do stir it with the whisk again at the end of the first day, usually. It will fill a 2-quart bottle (I use juice bottles when I have them) with about a serving left over for the current moment. It is very smooth and rich. As to making it in the coffee maker, the heat brings out the bitterness in the coffee. Cold-brewing does not. I’ve been told mine is much better than Starbucks (which is NOT hard to do, IMHO!). i’m considered some sort of a genius at work for bringing in an espresso machine. i wonder what they will think if i start to bring this in? Thanks! I was looking for a recipe that didn’t call for a pound of coffee and two gallons of water! A friend told me about this method, so I was trying to refresh my memory when I found your site. I’m going to try it, since I usually have to wait so long for my coffee to cool before I can ice it. 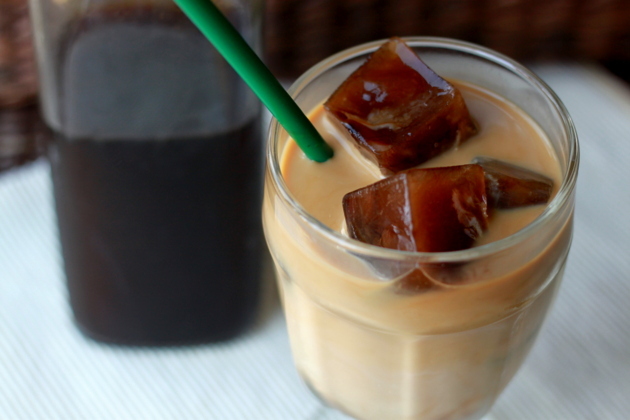 Speaking of ice, it looks like coffee ice cubes in your drink! Good idea! I found your site using my Stumble button and this recipe was GREAT! I’m a latte drinker so I used a bold roast coffee bean and mixed equal parts coffee/milk with a few ice cubes. It was the perfect iced latte! This is going to save me so much money this summer. Indian Cuisine-Made easy for beginners. Wow! This looks amazing. You have our attention! in a cup of beans? Thanks for making this waaaaaaaaay simpler than any other description I’ve run across of how to do this…Down to straining it through a coffee filter in a funnel….I like your style! Also…Rob. There are 8 coffee scoops to a cup of ground coffee. Thanks, Kim! I’m all about making it happen the easy (and stuff-that’s-on-hand) way. 😉 And thanks for answering Rob’s question! There’s a product called Cold Water Toddy that i’ve been using since the late 1970’s. it’s about $20 and basically you get a carafe, a funnel, some re-useable (for a time) cotton filters, and a cork to put in the funnel. you steep your coffee as described above and resulting concentrate is low in acidity and will keep easily for 2 weeks or more. you can use it for ice coffee AND regular coffee. just pour whatever amount pleases you into your coffee cup and add hot water or add cold water and microwave it for a minute and a half. presto, better-than-instant coffee and perfect for a household where i’m the only one who drinks coffee and who doesn’t want to make up and waste a whole pot. And, YES, you can freeze it just fine for later use, so enjoy! Loved this Cold coffee,especially during these days when the Monsoon has not yet arrived.. I found this recipe a couple of months ago and I am never without some in the fridge. I pour it on ice cream, make frozen lattes, and, of course, iced mocha coffee. It keeps for a couple of weeks, at least. I made tapioca pudding last night and poured some in there. MMMM good. So, again, it’s a cup of beans (which are to be ground before soaking in water) or how much coffee if you buy it already ground? I’ve read that 1T of beans makes 2T ground, but that doesn’t make sense to me. Can you help? Hi Mom on the Verge, I just measured out a 1/2 cup of beans and it actually came out to about 1/2 a cup with a medium grind. Hope that helps. Hey i just wanted to thank you guys for posting this recipe! i probably will never kick the coffee habit but at least i can kick the starbucks habit! Made the mistake of making 2 pints of this ‘concentrate’ last weekend, drinking it all on the monday evening. 2 pints of super strong iced coffee does things to your mind! Ha … yeah, too much caffeine can go from energizing to a little crazy-making pretty quickly! Amazing! I just found this yesterday and had to give it a try. We put the coffee and cold water in our French press last night and let it steep around 12 hours. This morning, we added the brew, (regular) ice cubes, sugar, cream, cinnamon and nutmeg to our blender and made THE ABSOLUTE BEST blended frozen coffee I’ve ever had. Because the brew is so concentrated, the ice didn’t make it taste watered down as usually happens when I try this on my own. Thanks so much for the great idea! This was awesome. I used Foldgers Country Blend for this and it came out so smooth. It is very strong, kept me going for 4-5 hours straight. This is genius – I’m in the kitchen now trying this out! So glad I found this post! We are supposed to be in the 90s this week, so I started a batch of this coffee immediately. I also dumped all my ice cubes and made fresh, including one tray of coffee cubes. Thank-you! 90s, wow! I guess its official, summer is just about here. Yay! Enjoy the lovely weather and your coffee! I have a question: Is the initial measurement of “1 cup fresh-ground coffee beans” before or after the beans have been ground? and wound up here Cold-Brewed Iced Coffee | Kitchen Treaty. And I actually do have 2 questions for you if it’s allright. Could it be simply me or does it look like some of these comments come across like they are coming from brain dead visitors? 😛 And, if you are writing at additional places, I’d like to follow everything fresh you have to post. Mention of low/no acidity and the emergence of background flavors makes me wonder if this would also be good heated up … gonna try it both ways. I love a good iced coffee. No rating due to the fact I haven’t tried it yet. OMG THANK YOU SOOOO MUCH ! This stuff is my new FAVORITE drink ! How long can you store the Cold-Brewed Iced Coffee concentrate before it goes bad?? In addition, The contents are masterpiece. you’ve performed a great task on this subject! I used to make a double strength pot of coffee & then let it cool in the fridge overnight, then next day we would pour it over ice & add two ounces of Bailey’s Irish Cream to it, great drink for those hot summer (non-working)days!!!! The last time I wanted iced coffee since I’m away at college, I brewed a hot cup and threw it in the fridge for a day, but this seems so much better. I just set this up in my dorm room, luckily I had a jar and I cut open some K-cups and tossed the coffee in. Hopefully this ratio of 2 K-cups to this one jar that’s slightly more than 1 cup in volume will work. If it turns out nice I should be doing this all throughout finals, thanks for posting this, I never would have thought of doing iced coffee like this on my own.